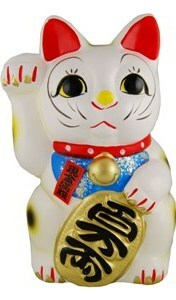 The maneki-neko or beckoning cat is a good luck symbol in Japan. The cats, found in a variety of colours and styles, are usually sitting up with one paw raised in a gesture of beckoning. The Maneki-neko is a common sight in Japan, placed in the entrances of shops and restaurants, in the hope that she will bring good luck and prosperity in the form of customers and extra business. The cat's colour, her attire and which of her paws is raised, even the height at which her paw is raised, all has significance. There are many stories surrounding the origin of the beckoning cat, perhaps the most popular being the Legend of the Gotokuji Temple. This story, which is thought to date back to the beginning of the Edo Period (1603 - 1867), tells of a local priest, who looked after the Gotoku-ji Temple in Tokyo and kept a cat. Despite his poverty, the priest often shared his limited food with his cat. One day, during a storm a samurai sheltering under a tree at the temple saw the priest's cat, apparently beckoning to him to come into the temple for shelter. Just as he approached the cat, a bolt of lightning hit the tree that he had been sheltering under, causing it to crash to the ground where he had previously been standing. Grateful to the cat that had saved his life, the wealthy samurai rewarded the temple with funding for its upkeep and adopted it as his family place of worship. 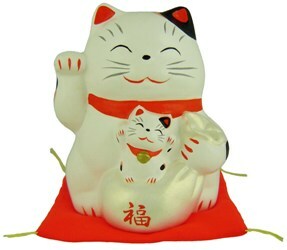 When the cat died, it was honoured by being buried in a special cemetery and a statue was made in his likeness, thus initiating the image of the lucky cat we know today.